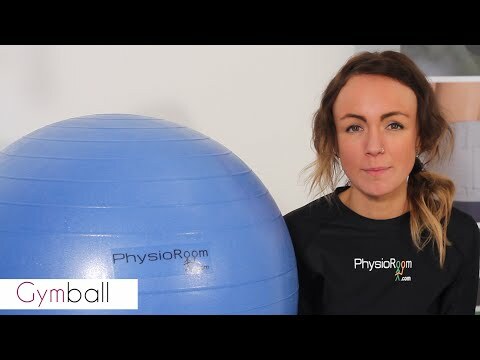 What is the Gymnic Classic Plus Swiss/Pregnancy Ball? Superb quality burst resistant inflatable Swiss Ball for rehab, training and pregnancy exercises. Whether your goal is improved strength, core stability, flexibility or balance, the Gymnic Classic Plus Swiss/Pregnancy Ball is ideal. For use at home or in the gym. Anti-burst makes it safest option during pregnancy. Red Fit Ball: 55cm (22") diameter for people 155cm-167.5cm (5'2"-5'6") tall. Blue Fit Ball: 65cm (26") diameter for people 167.5cm-175cm (5'6"-5'9") tall. Yellow Fit Ball: 75cm (30") diameter for people 175cm-192cm (5'9"-6'4") tall. Please Note: Diameter of ball is measured when ball is deflated. Use the PhysioRoom.com Faster Blaster Dual Action Pump to inflate the Gymnic Classic Plus Swiss/Pregnancy Ball. TheSwiss Ball is an integral tool in most Core Strength training programs. These programmes are designed to strengthen the core muscles of the trunk and pelvis, which are important for posture and sporting activities. Even it damaged with knives, or other pointed objects there is no danger of sudden lack of pressure in this burst resistant quality ball. BENEFITS:Improved strength, core stability and flexibility or balance. IDEAL:Designed to strengthen the muscles of the trunk & pelvis for posture & sporting activities. NOTE:If damaged with any pointed object there is no danger of sudden lack of pressure in the ball. Gymnic Classic Plus Swiss/Pregnancy Ball is in stock and available for immediate dispatch from our Warehouse facility in Lancashire, UK. Orders placed by 4pm Monday to Friday (excluding Bank Holidays) are dispatched the same day. If you need your Gymnic Classic Plus Swiss/Pregnancy Ball in a hurry, next working day delivery is available for UK mainland addresses.